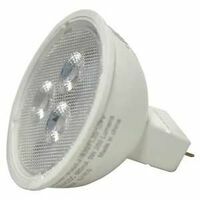 Dimmable LED bulb, 4 watts, 12 volts, will replace a 35 watt incandescent. MR16 with GU5.3 base. 300 lumens, 3000K. Instant on to full brightness. Average life of 25,000 hours / 22.8 years. 100 percent mercury free. UL/CUL, FCC and RoHS Compliant. MOL 2" x 2". 40 degree beam angle. Bi-pin, 12 volt, 3000K color temperature. Replaces a MR16 bulb. RoHS and FCC Compliant and mercury free. Instant on to full brightness, indoor, suitable for damp locations.